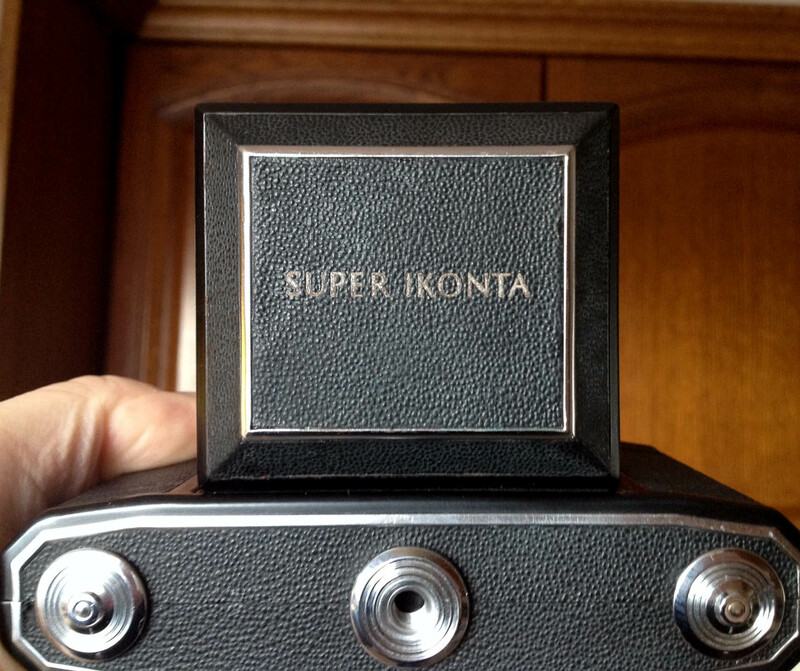 Picked up the Super Ikonta yesterday and was pleased to find that it's in great shape with no faults at all from what I can see (although I won't know for sure about the bellows until I've run a film through it). 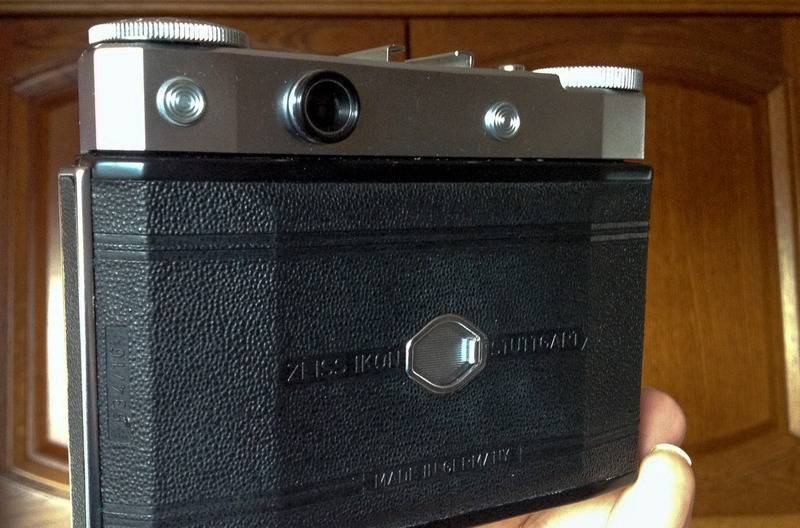 It certainly doesn't look like a 60-year-old camera. The shutter speeds, as I discovered at the auction, sound about right and, crucially, the lens is very clear indeed with no fungus or haze and just a few of the usual dust specs. Doesn't look great, does it? I took these whilst sitting at the dining room table checking the camera's functions. 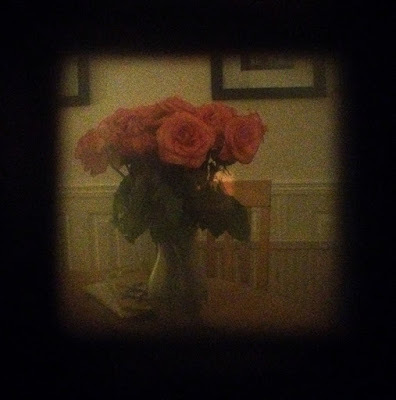 The pic of Cath's roses turned out very well in a Holga-esque way with a certain romantic look to it. In fact, I did think for a brief instant that I could start a new project taking iPhone photographs through the Ikonta's viewfinder. But then I realised that there's probably already an app for that look - the "Ikonta Filter", or something. It would have been nice to have taken the same pics for comparison through the cleaned-up viewfinder but I was too impatient and so, instead, here's a through-the-finder snap when I was out and about earlier today. You'll have to take my word for it that there's been a big improvement. As you can see, there are no frame lines in the viewfinder: what you see is what you get. 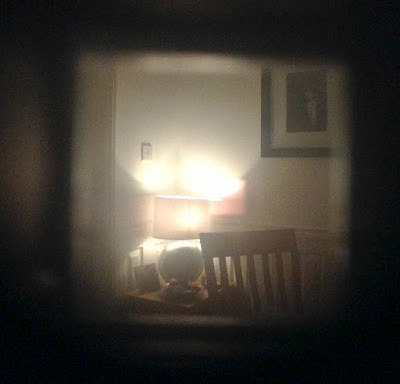 The only bit that could do with a light cleaning now is the beam splitter glass that sits at a 45 degree angle to the viewfinder eyepiece. I think it's a little cloudy but not enough that I'd want to take the top off and there's always the chance that the fine, mirror coating on the glass could be damaged in the cleaning so best to leave it alone. to be at his peak in the 1950s. 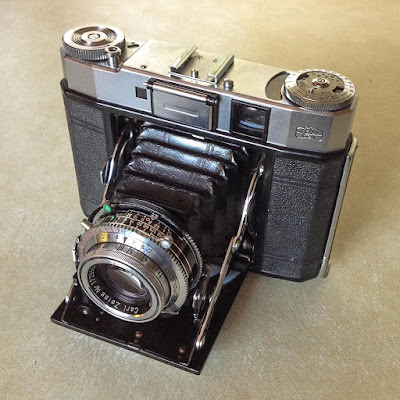 The rangefinder spot is quite clear and the rangefinder itself is fine although it will be interesting to see what the results are like up close and at open aperture. 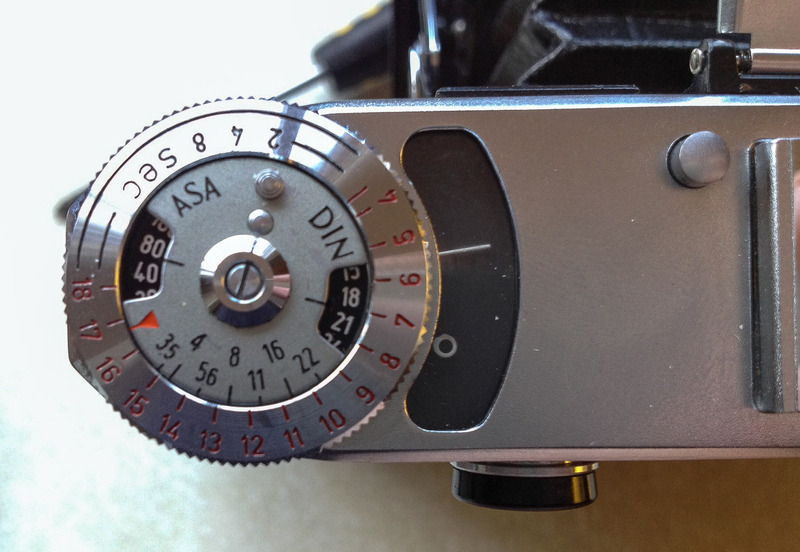 Even the selenium light meter that seemed dead now looks sort of OK. I think it was just too dark in the auction hall when I tried it for the few photons kicking about to deflect the meter needle. Out in the read world, the needle is responding quite enthusiastically. BUT, the actual meter mechanism - the pointer that has to be lined up with the needle to tell what the exposure should be - isn't working properly. When I try to match it up with the needle, it moves part of the way and then no further. You can see it in the pic below. Fixing that would be a top-off job but the chances of the meter being accurate even if I managed to sort it aren't great really. I'll be using my Sekonic anyway so it seems a pointless exercise unless I decided to sell it in which case it might matter to a collector. That's about as far as the round-eyed needle moves in pursuit of the meter needle. Something must have either broken or become disconnected beneath this dial. Perhaps I'll get round to fixing it one day. the dark when it's not needed. 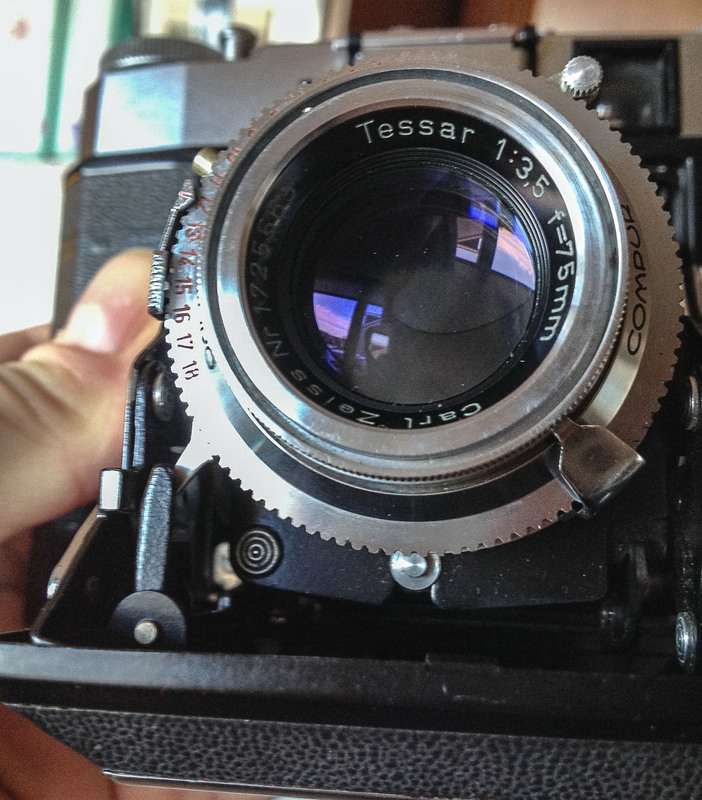 The Tessar was a little grubby, too, but has also cleaned up well. So, all-in-all, not a bad bit of kit! 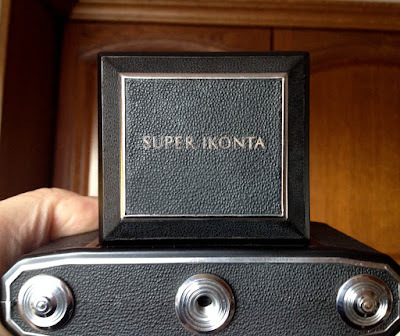 As you'd imagine for such an illustrious name, there's quite a bit of information on the 'net about the Super Ikonta IV, the last of a long line produced between 1956 and 1959/60. The Super Ikonta IV was also the last of any folding cameras to be produced in West Germany. It's supposed to be the zenith of these cameras but I reckon the earlier Super Ikontas were better made - they certainly feel more substantial. Of course, there's more to a camera that the gauge of metal it's made from and I've no doubt that the IV will prove to be the more user friendly and the Tessar will give the best results short of a similarly-equipped 6x9 cm Ikonta. The camera, in common with some other folders, has one drawback and that's down to the thinner backing paper now used with 120 film. Unlike most other folders, there's no need to use a red window when winding the film on as the process is automatic. The Super Ikonta IV is able to judge when the film has been wound on to the first frame - or at least it could with the old, thicker backing papers from long ago. 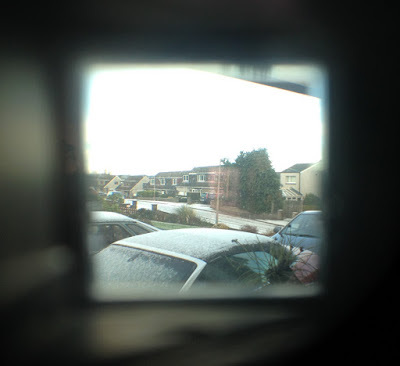 Today's roll film causes the camera to mis-calculate and the results can range from very closely spaced frames, no spaces between frames or even over-lapping frames. The answer seems to be to attach some duck tape - just a two-inch or so length - to the leader just after threading the film onto the spool. That extra thickness is enough to sort out the problem. Some photographers say that Foma use slightly thicker backing paper on their 120 films and that these can be used today without modification. Either way, it's not a big deal. 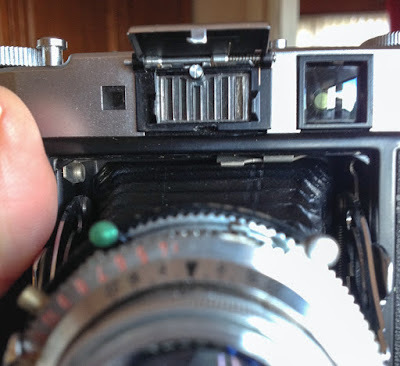 Slide back the cover on the wee window on the back and there's just a "hole"
for checking if there's a film loaded. Film loading is automatic so no red window. an awful lot of use or was very well treated by a careful owner. Reader Kerstin Jonsson said in a comment to my previous post about the Super Ikonta that, "The output Q/M (quality per mass) you get from the Zeiss is hard to beat." That's an interesting way to look at it. There may be 35mm cameras with sharper lenses but they're hampered to some extent by the smaller negative and the need for a bigger degree of enlargement. Large format would be a clear step up but with a considerable weight penalty. Maybe 6x6 folders are the sweet spot? 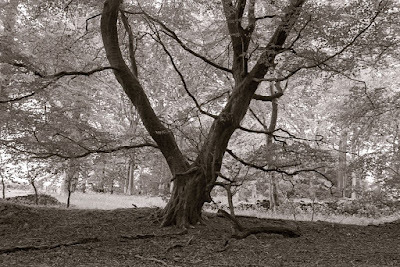 The more I thought about it, the more I realised that a relatively lightweight Super Ikonta with a good rangefinder and fine lens hanging around my neck wouldn't be the worst tool for walkabout photography in the countryside. I have a feeling I'm going to enjoy feeding this one some film. Nice to hear that it seems to be a good buy ! .Is this a 35 mm or 6x6 ?My Agfa Isolette is a 6x6 .WITH no indication of asa on the meter ...(it's Agfa L ) but the meter look the same system of your Ikonta . It strikes me that your mojo is coming back! Have fun and look forward to seeing the results. Yep - can't wait to see some results from this Bruce - fingers crossed it is all tickety-boo! It looks to be a beautiful camera and a hell of a bargain. Show us yer negs . . .